One of the really fun things in life for me is the hatching of ducklings and goslings. I have been doing it for over thirty years and it is still fun and a little bit amazing each year. The fact is, however, that for many people, a significant portion of the ducklings and goslings hatched never reach adulthood due to losses experienced during the rearing process. Even worse, most of the losses are preventable. This article is designed to help beginners to avoid the pitfalls and by so doing, raise the maximum number of healthy young waterfowl each year. The first thing to do is to be prepared with proper facilities before the ducklings or goslings arrive. That means having a suitable brooder. A brooder is a box of appropriate size with a source of heat for the young birds. A brooder can be as simple as a large cardboard box with an overhanging light bulb or as sophisticated as a metal brooder complete with a heat bar and built in feeders and waterers. Of course, the first costs very little and the second may cost a hundred dollars or more. What features are important for a brooder to possess? First, it must meet the heat and space requirements of the ducklings or goslings. The youngsters will need a temperature near 100 degrees F. for the first week or so but as they grow, their heat needs will diminish steadily. Even that first week, their heat may be supplied by a 100 watt bulb suspended over them. By the end of week two, that bulb may be replaced by a 60 watt size. In a commercially made brooder, a wafer type thermostat fulfills the same function. Furthermore, the heat bar cannot burn out, break or even explode like a bulb can if touched by a wet little bill. For that reason, if a bulb is used as a source of heat, it must be periodically raised to a position a few inches above the heads of the young birds. A big plus from a cleaning standpoint is a wire mesh floor. 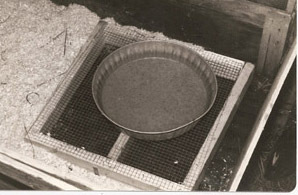 The mesh floor allows manure and water to fall through the mesh (made of hardware cloth) onto a droppings tray below. The biggest problem with a brooder is that as the young birds grow (and you will not believe how fast they grow until you see them) the size of the brooder must increase to accommodate them. Six square inches of space may be quite adequate for each day old bantam duckling (make that a square foot for a duckling from a large breed and perhaps eighteen square inches for a gosling). The ideal situation is to have a second brooder perhaps twice the size of the first and then to move the birds to a floor pen with an available source of warmth (used only at night or when the weather turns cold) after that. Needless to say, if one begins brooding ducklings very early in the year, they will require heat for a much longer period of time than if they are started, say, in April. mesh is a good way to keep the area dry. The brooder must contain a feeder and a waterer for the young birds. Ideally both should be easily cleaned and large enough to allow for filling only once a day. The waterer must not be deep as ducklings in particular are famous for playing in water containers they can get in and by so doing, chilling themselves. To a young bantam duckling in particular, that can be fatal. If a narrow based watering jar cannot be located, a wide mouthed base can be used if it is equipped with marbles so that bantam ducklings cannot immerse themselves. Mason jars with a screw- on base are probably the best type of water container for young ducklings or goslings. Poultry supply houses sell them in many sizes so it is easy to provide larger ones as the birds grow. Neither ducklings nor goslings should be allowed to be deprived of water for any significant time. If they are without water for a long time, they will over drink when they get some and can be lost to a condition known as the "staggers" as a result. The way to avoid "staggers" if water has run out for a group of young waterfowl is to supply small amounts of warm water at intervals to regulate their water consumption for an hour or so until they no longer crowd the waterer. Q: How long will my ducklings or goslings require heat? A: That depends on the weather if they are in an unheated building. Normally, both ducklings and goslings will require no more heat by the time they are beginning to feather over their backs. If they were hatched very early, however, and it is still often quite cold, they will require heat longer. Q: How can I tell if my ducklings or goslings are warm enough? A: They will tell you if you observe them carefully. If they huddle around the heat source, they are too cold. If they are busy moving all over the brooder and are eating and drinking freely, they are fine. Q: If I choose to use the cardboard box brooder, what is the downside? A: Much more work and inconvenience. The floor of the box will get soggy and must be changed regularly. As the youngsters grow, they will require larger boxes. Since the floor is not mesh, such brooders are fairly hard to keep clean. Q: What is the most often encountered problem with brooding ducklings and goslings? A: Inexperienced breeders underestimate the growth rate of their young birds and often are unprepared for how much space they will need as they grow. Overcrowding invites disease problems and losses. This group of bantam ducklings will out -grow their brooder space within several days. Today, commercially prepared "starter/ grower" feeds are available that takes most of the work out of feeding young waterfowl. Keep them on the starter/ grower for the first three weeks and then switch them to a duck grower pellet (about 16% protein) all the way into adulthood. It couldn't be much more simple or easier. Many starter feeds are medicated with an Amprolium based coccidiostat. Such a medication will not hurt either ducklings or goslings. If feed becomes wet or pasty in the feeder, replace it with new feed and move the feeder further away from the waterer. Never allow young waterfowl to get access to mouldy feed- it can kill them quickly. Increase the size of the water containers as the birds grow so there is no chance that the birds will be without water for a significant period of time. Bedding (if the birds are not on wire) should be as dust free and as absorbent as possible. I like to use pine shavings of good quality. Both ducklings and goslings really appreciate some fresh greens if they have no access to pasture. Fresh cut grass, chopped dandelions, etc. are great for that purpose. Goslings should be given access to grass from an early age if at all possible. They must not be allowed to get soaked during rainstorms so limit their pasture time to sunny days until they are at least two months old. As the young ducks and geese grow, it is a good idea to begin introducing them to a ration of whole grains, particularly whole oats. Like a child eating spinach, the young birds must be taught to eat whole oats. Limit the amount of corn they get as it builds fat unless they are be readied for market. Once the young birds are a couple of months old, they need to be outside a good part of each day if at all possible. The pen or pasture should be at least partially shaded and should contain a plentiful source of fresh water. They should also be limited in their access to the grower pellets. Two daily feedings of what they can clean up in, say 15 minutes is about right. The rest of the day, they should be supplied only with whole oats in their feed pans. If they get hungry, they will eat it and learn to accept it as part of their feeding program. A pen that contains good pasture is a huge plus for either ducks or geese but for geese there really is no substitute for pasture. During the time the young birds are from 1-3 months of age, they should be protected from rainstorms and good fencing should be provided to protect them from foxes as well as stray dogs. They should be locked in a secure enclosure at night. That enclosure should have a top and should provide protection from the elements. Once the ducklings or goslings reach three months of age, they can be treated as adults.